f.17' Residency, Rajkhot' (Rajkot, Kathiawar). bl.uk > Online Gallery Home	> Online exhibitions	> Asia, Pacific and Africa Collections	> f.17' Residency, Rajkhot' (Rajkot, Kathiawar). 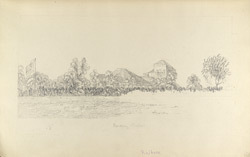 Pencil drawing of the British Residency at Rajkot by George Boyd (1800-1850) dated between 1821 and 1844. This is one of 95 drawings (90 folios), chiefly of landscapes and monuments in the Deccan, West India and Afghanistan made duirng that period. Boyd served in the Bombay Infantry from 1820 to 1850 and was chiefly employed in survey work. From 1822 to 1831 he was in the Deccan and Satara; in 1835 he was on survey in Kathiawar; and in 1839 he was making road surveys in Sind. He was mentioned in dispatches during the war in Afghanistan in 1840 and in 1842 he worked on a survey between Quetta and Kalat. Rajkot, situated on the Kathiawar peninsula in Gujarat state, west-central India, was once the capital of the small but influential state of the same name. There are many fine 19th-century colonial buildings here. Until 1947, the city was headquarters of the local British Resident for the Western Indian States. The British influence can be seen in Rajkumar College and its vast grounds, a famous public school founded in 1870 and the Memorial Institute. Rajkot was the early home of Mahatma Ghandi.